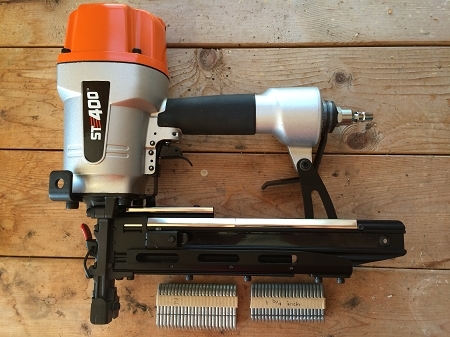 The Stock-Ade ST400 is a pneumatic powered stapler. This tool drives 1-1/2 inch, 1 3-/4 inch & 2 inch barbed staples. 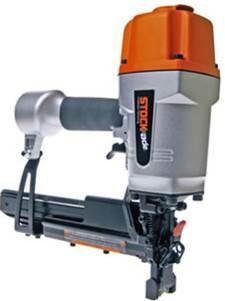 The ST400 is designed for high volume fence construction and removes the labor out of manually stapling a fence. Built to last in tough conditions. STOCK-ade and Paslode are registered trademarks of ITW Inc. The ST-315 and ST-400 logos and associated graphic devices are trademarks of ITW Inc.
© 2012 Paslode and Illinois Tool Works Company. All rights reserved.